Existing Home Sales surged 12 percent last month, closing 2010’s housing market with strength. An “existing home” is a home that cannot be categorized as new construction; a resale. According to the National Association of REALTORS®, seasonally-adjusted, annualized Existing Home Sales figures climbed by more than a half-million units in December as compared to November. It’s the 3rd straight month of home resale improvement nationwide. Sales volume is now as high as it’s been since May 2010 — just after the federal home buyer tax credit’s expiration. In addition, the number of months needed to sell the complete, current home inventory at the current pace of sales fell by 1.4 months, tying December for the biggest one-month home supply improvement in 2 years. It’s yet another signal that the housing market is in recovery. Not that this data should surprise anyone. November’s Pending Home Sales report told us to expect it two weeks ago. 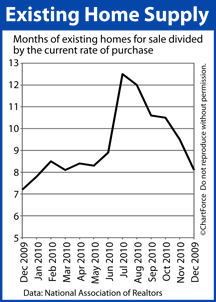 Cash buyers represented 29 percent of all transaction, down 2 ticks from November. This may suggest that mortgage guidelines are loosening — another sign of economic improvement. So, take note, home buyers. This spring, along with mortgage rates, home values should rise, too. Expect less “bang for your buck” as the housing recovery takes hold across the nation. The best deals of the year may be the ones made this month.